I was involved in a near fatal accident in January 2017. I was rushed to Gbagada General Hospital and was rejected without any form of medical assessment because there was no bed or something, I was told I was conscious but I can’t remember A THING. The same thing happened at Lagos University Teaching Hospital (LUTH) until my bosom friend arrived and must have created a scene before a young doctor came out and somehow, they found a stretcher and a space UNDER the staircase. I woke up the next morning with Intravenous Drips (IV) hanging and I was pressed, I found my way to the toilet dragging the IV Drip hanger along but the moment I opened the toilet, the need to pee disappeared. I insisted on leaving immediately, I woke up pretty much from the dead and the unhealthy state of the facility was scarier than I could imagine, it was dangerous to my health. I am sure that if I’d required medical care outside Nigeria at that point, the airline or carrier would have been of no significance. Nigeria’s health sector is in shambles, our sickly president is always off to the UK when he sneezes but here we are, about to setup a National Carrier with $300m when even the elites, not to now imagine the real, common, average Nigeria don’t even have access to basic health care even if they have to pay for it. I can still hear the voice of the Vice President Prof. Yemi Osinbajo so loud at the Bola Tinubu’s annual birthday bash aka Colloquium as he listed the number of projects that $3Bn was going to deliver across the nation, I’d imagined the number of Federal Hospitals that $300m will bring back to life with standard facilities and the number of lives that it will affect. Maybe I think too much about Nigerians and less about the national pride because that’s seems to be more important than Nigerians right now. As one of the many few right thinking Nigerians, I got excited about Nigeria Airways coming back to life when the campaign team of Muhammadu Buhari described the 11 Aircraft strong Presidential Air-Fleet (PAF) as a waste and mentioned the possibility of it being the starting point for a new National airline or carrier as the case may be in 2014. It made a whole lot of sense to me because I’d vehemently talked about, and written against the needless huge PAF in my satire “Flying On The Wings Of Corruption” in 2013 (a year earlier), it was the logical thing to do because it won’t cost Nigeria so much to start with what we already have domestically, and from there grow into gaining continental grounds from it. According to reports then; the PAF was larger than the three working domestic airlines we had operating in Nigeria combined and the cost of maintaining it was outrageous. The Jonathan administration was even planning to add one more bird to the gang at the expense of Nigerians as at the time and the thought of making money out of a N60.53Bn burden was just relaxing and I was all for it, but that was in 2014. The whole conversation about reviving the Nigeria Airways went under the moment President Buhari took the reins of power three years ago, he’s been sitting on the huge PAF he once described as “waste” until December 2017 when information filtered about something cooking in the air courtesy the Aviation Minister Hadi Sirika. 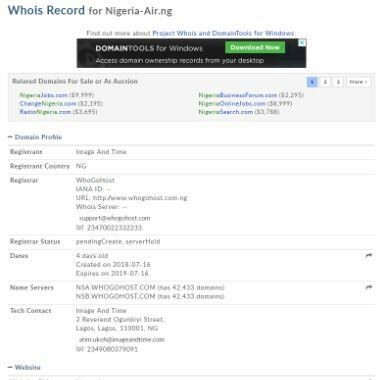 Naturally, I was interested and one would have expected that the conversation and direction will be to follow through on the earlier promise of starting with the resource we already have, towards building a new stronger and better identity for the Nigerians Airways, but I was shocked when I discovered that the Ministry and the government are on the part of waste that defined and destroyed the defunct flying elephant; Nigeria Airways. I automatically stood against the idea for sane reasons that shouldn’t even need any form of explanation. Nigeria was planning to invest $300m plus facilities in the new Nigeria Air project for a ridiculous 5% stake for the pride of it instead of the original plan of throwing in the PAF into the project to start small with reforms in the aviation laws that killed the “Flying Elephant” or address existing defects that has crippled public service and institutions that are existing under the guise of a MOU that is yet to be signed with non-existing partners. The saddest part of the proposed venture was that there were no plans (if any) to harness the resources we already have, the focus was on buying new airplanes; starting from the top, knowing fully well that it is a journey to colossal waste as usual. The defunct Nigeria Airways was born in 1958 and after 45 years of being abused and raped, it died a very natural painless death under the watch of Olusegun Obasanjo in 2003. The business class compartment of the 32 aircraft strong airline was constantly occupied by government officials and their cronies when it lived, and the last recorded international flight on Nigeria Airways was New York to Lagos, a flight that had passengers contributing to buy aviation fuel for the flight after it was delayed for 24hours. Staff were laid off without much ado and till today, pensions are unpaid. The news of a rebirth fifteen years later would have been worth celebrating only if things were in the right perspective, but the new Logo of the proposed National Carrier of Nigeria was designed in Bahrain, unveiled in London with made in China souvenirs seems to be the only thing we have to show for the supposed rebirth. Apparently the Minister of State for Aviation Hadi Sirika and Minister of Transportation Rotimi Amaechi are only ready to reposition Nigeria Air in a foreign atmosphere in their obviously uncharted attempt to bring Nigeria closer to the world. While Hadi Sirika was celebrating nothing at the unveiling in London, a smarter and more business oriented Nigerian named Mayowa Elegbede had noticed the lapse in the Ministry’s preparedness. 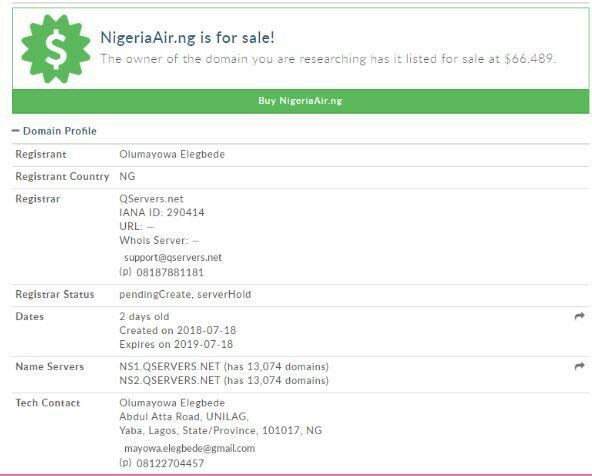 Sirika and his team had failed to secure the web domain for NigeriaAir so he went ahead to register “NigeriaAir.Ng, NigeriaAir.Com.Ng, NigeriaAir.Com and Nigeria-Air.Ng” and listed them for sale at for an average of $24,000. 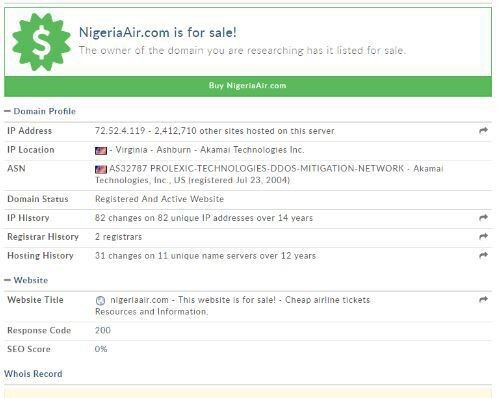 I am sure that price might become more expensive since these domains are going to be the most likely URL that will be home to the airline’s business if it ever flies. 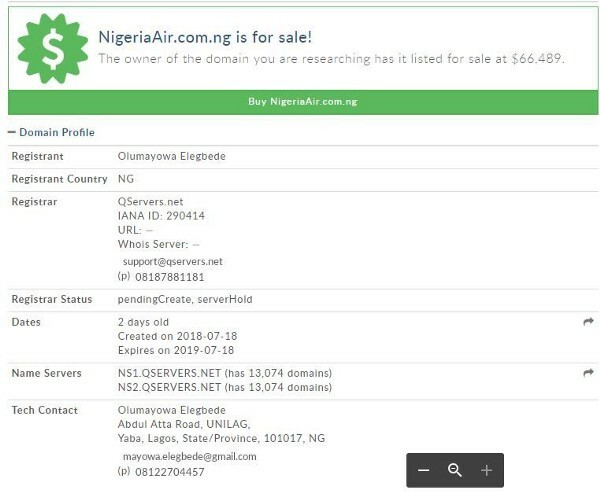 It will be almost impossible to host it on the high level reserved “.gov.ng” domain since it is supposed to be privately owned with government owning just 5% of the venture. If a whole Ministry remembered to design a logo abroad, print T-shirts and Goodie Bags in foreign lands but forgot to secure perhaps the most important platform required for running an airline business in the 21st century “the web domain”, my fear of it potentially failing even before it starts is fairly justified to a substantial extent; perhaps they plan is to use the domain “NaijaAir” which was still available as at 21st of June, 2018 before it was registered by Tolulope Olufohunsi. Farborough Air Show in London is perhaps a smart point to reel out the potential of having an investor-based airline and national carrier, but a mere 5% stake is indeed a signal that will make potential investors run away from investing in a country where you will be responsible for generating your own electricity. Air France-KLM bought 31% stake in Virgin Atlantic for £220m with investment from Delta Air Lines but Virgin still holds on to a 20% stake in the trans-Atlantic airline, and hold onto the chairmanship, as a result of the deal which will see a closer union between the four airlines. 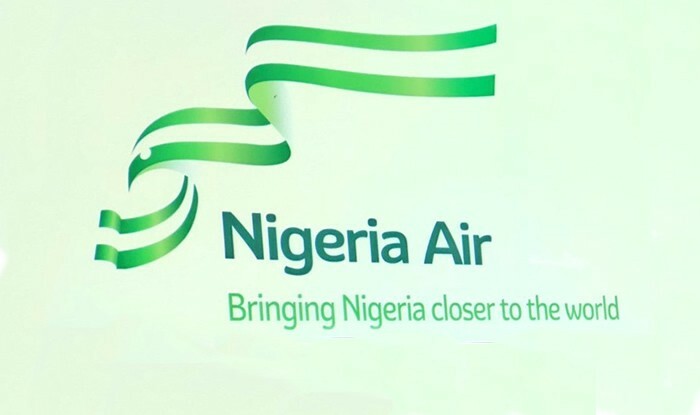 Nigeria currently own 49% of the NLNG and we don’t have any business in how it is being run so giving away 95% with $300m investment is not only a bad business model, it is a prototype for failure and sign that the men behind the project are only interested in the name “Nigeria Air”, a perfect design for failure. Do I need to comment on the pride thing further? I don’t think it is necessary because how can a nation of sane people be more concerned about “National Pride” when the nation is in obvious disarray, isn’t that misplaced priority? “Oh! We want a national airline!” the truth is that there is a world of difference between a “National Carrier” and “National Airline” and a whole lot of people don’t see the difference. A National Carrier flies the national flag; a National Airline is state owned and we can’t afford one. Having a private entity to wave the Nigerian flag in the air will not make Nigeria great again, we need a working Nigeria that is not just a destination for exploitation before we can be proud about anything. “Oh! It will create jobs!” I agree, but how many jobs will be created? A huge percentage of the professional opportunities will still be imported, only the hand-to-mouth segment of the industry will be populated by Nigerians. There are more value sectors that can be explored. An investment of $20m in fifteen new and existing medical facilities will create more jobs for hundreds of doctors, nurses and medical staffs, these are home grown expertise, not pilots and aeronautic engineers that we will probably have to import from abroad. If at all Nigeria is interested in Nigeria Air, let us start with what we have and target local and continental destinations in Africa, West Africa and Nigeria, let us pull the aircrafts from the PAF and put them to serving the people and not the elites, let the government of the day present a roadmap for the proposed airline and not the unintelligent “it is the investor that will be managing it” narrative that holds no value for even the government or the people of Nigeria. 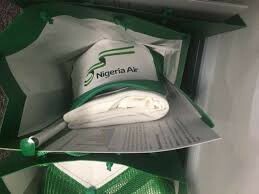 I am interested in Nigeria Air, I am even more interested in its success, I will gladly market the brand and sing but this is not the time. The government of the day has neither the plan or capacity to plan, nor the resources to make it a success and any attempt to go ahead without this two major ingredient will only result in the waste of the commonwealth of Nigerians on the altar of undesired national pride.